Our unique panelling system has been carefully considered. 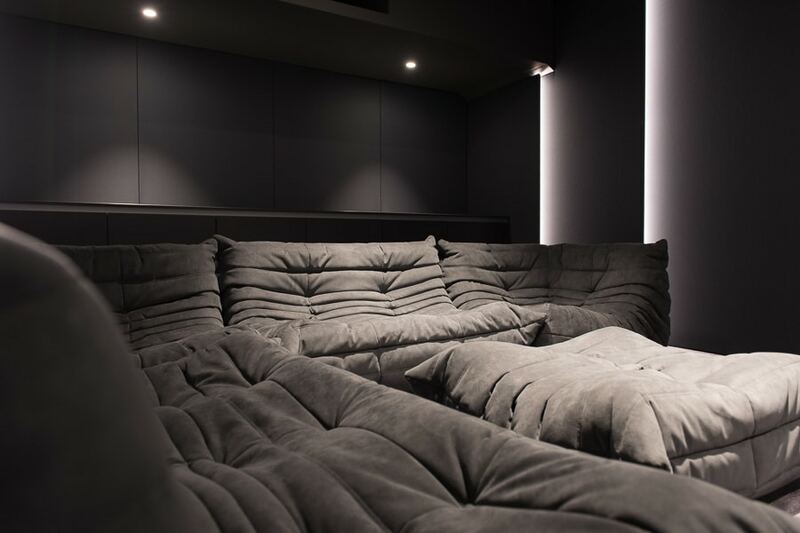 We have developed a contemporary home cinema room package, 7.1 surround sound and led lighting are concealed within the acoustically transparent panels resulting in a simple, clean look whilst maintaining authenticity. All aspects of installation can be designed around your space, requirements, and budget. 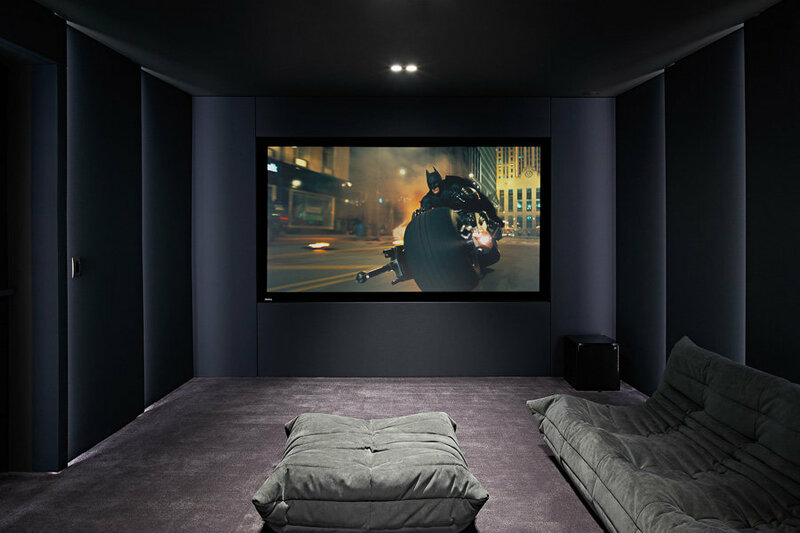 When faced with a recent challenge of converting a bedroom into an uncompromised home cinema, we were prompted to develop our system further, incorporating existing windows and doors within the panels themselves. The finished project was successful beyond expectations allowing us to offer a new level of versatility. 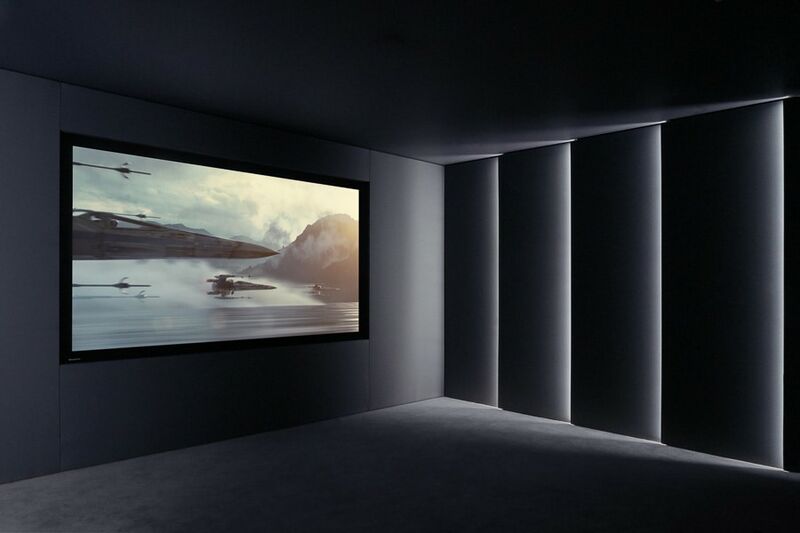 Rooms are created to meet industry standards ensuring the audio visual equipment is placed in the optimum position to give the best experience possible. Offering the complete package ensures work is completed methodically and components are integrated seamlessly. Individual rooms have individual requirements. We can offer the speaker package to suit your space and budget. Lighting, sound and pictures can be controlled conveniently via your smartphone or tablet. Incorporating ceiling spotlights and feature led lighting we can create scenes and stepped lighting programmes to suit your requirements. Acoustic installation will ensure that outside disturbances are kept to a minimum. Your project room need not be compromised by windows or doors. 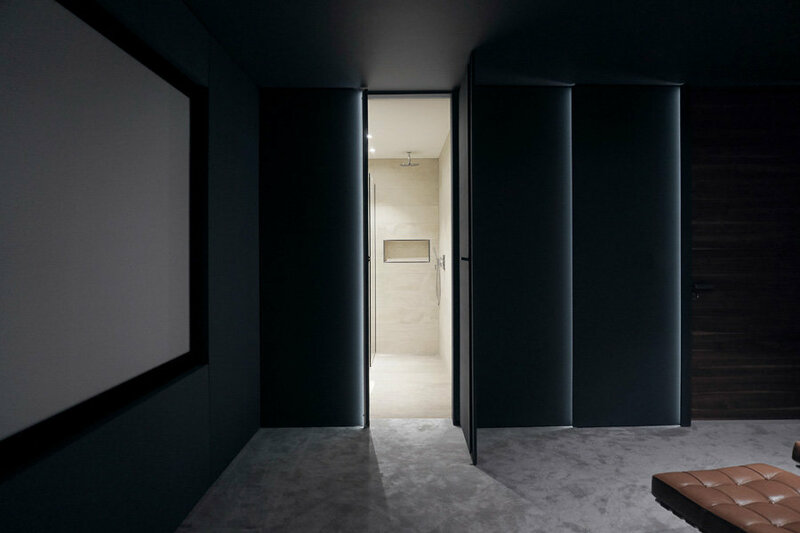 Our hinged wall panels can incorporate existing features without permanently affecting their functionality. Trimless ceiling spotlights contribute to an overall feel of impressive simplicity. Though we recommend keeping the tones dark, our acoustically invisible fabrics are available in a variety of colours. 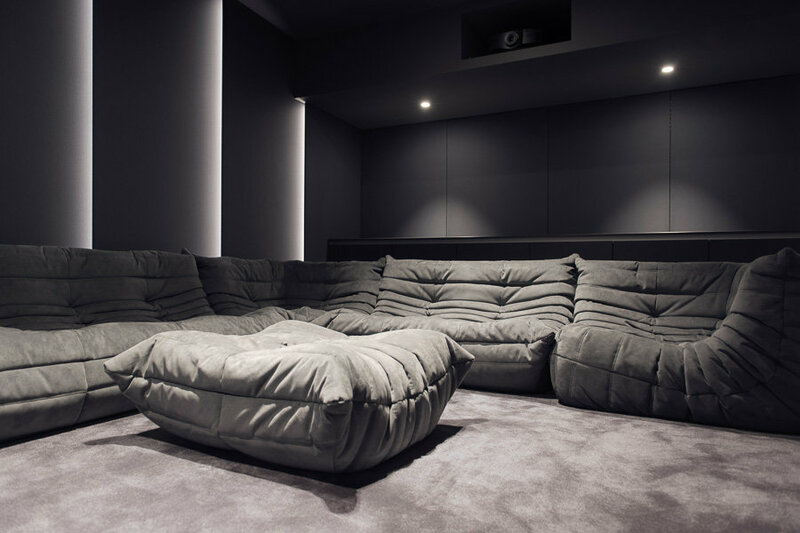 Electric reclining cinema seats maximise comfort and authenticity. A detailed site survey ensures that the components for your project can be prepared and built off site in our factory, resulting in minimal disruption during installation. 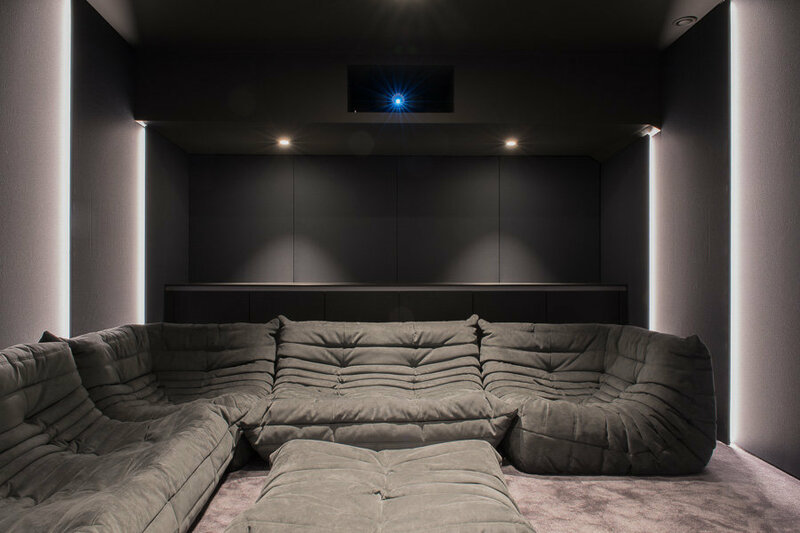 As a construction company we could offer an extension or garden building to house a new home cinema, contact us for details. Room conversion size of 4M x 5M. 8x wall panels with feature lighting, 2 x hinged feature wall panels with led lighting. 8 x plain wall panels (usually used front and rear). Entry level speaker package, projector and screen, apple tv. Room rewire incorporating 6 new spotlights and basic lighting control. Ceiling decoration.